Tri-Chandra Military hospital (TCMH), established in 1925 AD (BS 1982) in honor of Nepalese soldiers who dedicated their life in the First Great War was considered one of the best modern hospitals of its time. Besides the historical identity and its architectural grandeur, TCMH has many more glories attached to its name. It was the first hospital to introduce fiber optic endoscope services and establish semi automatic pathology lab in the country. Its upgraded services were shifted to Shree Birendra Hospital (SBH) in Chhauni, Kathmandu in 1989 availing new technology and treatment modalities like MRI and Extra Corporeal Shock wave lithotripsy (ESWL), multislice Helical CT for the first time in Nepal. The transformation of TCMH services to SBH and subsequently NAIHS moving in on this footing has been considered major milestones in the history of Nepalese Army Medical Corps (NAMC). 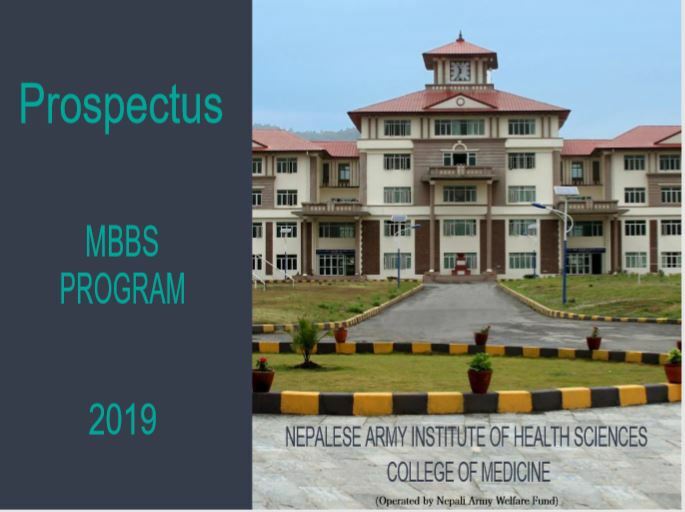 The concept of NAIHS originated with the imminent need to improve patient care system within Nepalese Army Medical corps which could only be achieved by igniting medical potentialities of its health professionals with academic fire by having a medical institute of its own. There is an acute short fall of the qualified Health professionals in the country and Nepalese army Medical corps (NAMC) is no exempt.